So, I’ll be teaching this in July along with luminaries Lynda E. Rucker, S.P. Miskowski, and Michael Cisco – Writing Horror Fiction with Substance. My week will be all about self-editing for writers, how to get your work into the best shape possible before you inflict it on others (especially editors). Over the space of four weeks, a quartet of today’s leading horror experts will take you through the elements that go into constructing a better horror story, from introducing weird elements, to better understanding POV, to finding your best setting, and finally, teaching you to edit your work to a fine point. This entry was posted in News, On Writing: General, On Writing: Short Stories and tagged and Michael Cisco, angela slatter, horror writing course, LitReactor, lynda e rucker, S.P. 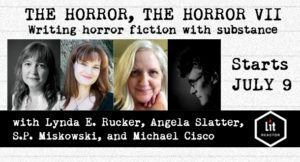 Miskowski, shirley jackson awards, The Horror, The Horror VII: Writing Horror Fiction with Substance. Bookmark the permalink.